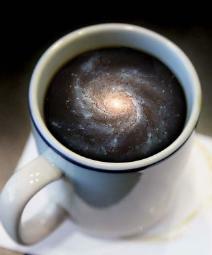 Please join us each morning at 10:30am in the Astronomy Conference Room (4054 McPherson) for Astro Coffee, an informal morning free-for-all where students, postdocs, and faculty debate up-to-the-minute astronomical developments. Discussions are drawn primarily from the most recent papers posted on the Astrophysics e-Print archive, or from recent colloquium talks. We also occasionally deconstruct astronomy articles appearing in the public press ("Our source was the New York Times "), receive reports from recent scientific meetings, and extract added value from visiting colleagues. Start your day off right and join in the fun. Visitors are always welcome (and your first cup is free!). Fresh-brewed coffee, tea, sugar, artificial sweetener, and little packets of nameless non-dairy pseudo-cream-like processed-pasteurized food product provided. BYOM (Bring Your Own Mug). Drinkers of other beverages, caffeinated or otherwise, are always welcome.